We have been given the opportunity to design a home on the northern beaches to provide accommodation for a large family and their many pets. The property is discreetly positioned at one of the highest points in Dee Why with ocean views towards palm beach and to narabeen beaches. After living at the residence for a number of years, the owners felt the existing layout of the house did not suit their lifestyle and wanted a home that took advantage of its position plus meet their everyday needs. However it was also important to them, the house be also a place of rest and inspire creativity and ideas. with the constraints of ‘Alts & Adds’ or if a new dwelling was the appropriate form of development. After considering all the issues, we set ourselves a challenge to see if we could achieve a good design while retaining the lower portion of the building. We believed the cost to rebuild elements such as the pool would be a very costly exercise due to the limited site access. With this in mind, our design is a series of two linear elements extending the length of the site to embrace its view. The residence has been configured with an ‘upside down’ configuration with bedrooms on the lower level and living on the top. Allows us to maximise the water views from the living rooms spaces. The design takes this a bit further by cantilevering elements over the existing foundations below to draw the surrounding views into the residence. The residence has a series of outdoor connections on all levels and including a large alfresco area around the pool to entertain friends & family. On the top level, the open plan configuration which allows for the view to be admired from every point of the room. We feel we have achieved a good design outcome for the owners with a degree of confidence that we have chosen the most appropriate form of development. Our design philosophy with selection of colours and materials, they should enhance a both the exterior and interior appearance of the space. We the design should take precedent and where possible to use the natural colour of materials which can add character and charm . As with many of our projects, we like to leave some architectural element exposed throughout the house, we find there are certain colours and tones that complement the use of these materials. We find all well designed spaces should provide good light and a connection to it surroundings. Therefore the simple use of white walls can be sufficient to allow the play of light and be a backdrop to the landscape beyond. We then often suggest adding colour via the fixtures, fittings and artwork rather than adding feature coloured walls. We often forget with an open plan style configuration, there are many elements within a space which all contribute to the overall juxtaposition of colours. We find keeping a simple use of materials allows the most flexibility in overall colour selections for their furniture and fittings throughout the home. In designing a home, we have a preference to keep materials in their natural state if possible. The use of galvanised steel, raw fibre cement sheet, timber and sandstone are materials which age over time to add a certain charm. When we use colour we like to measure the light in space to determine if we can add contrast in colours such as using both light and the contrast of dark colours. 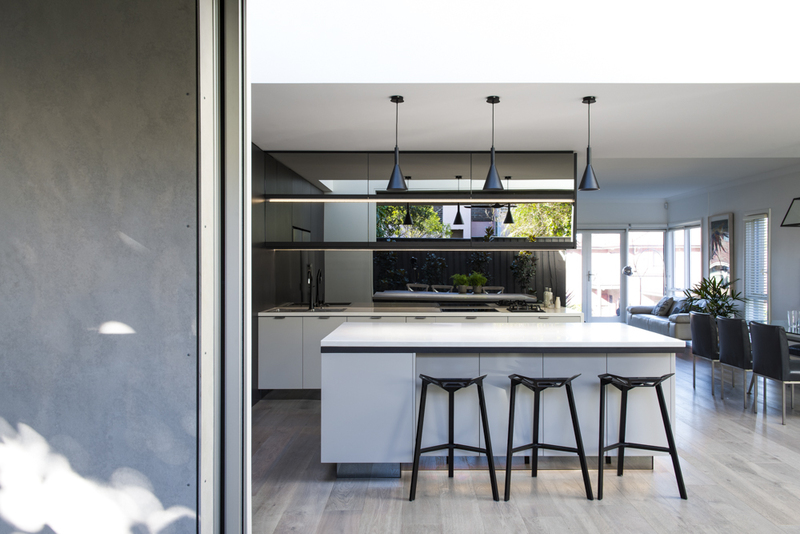 For instance, we have found using a black ceilings as a great way to offset against the grey tone of polished concrete to give a richness to the space. Lately we have been are using reflective metallic materials such as brass to highlight our joinery pieces and add a touch of class. With the cost of housing in Sydney reaching new levels, we are finding some of our clients considering alternative forms of housing to allow them to enjoy a new home yet offset the cost of construction. We find housing alternatives such as dual occupancy living to be very effective in allowing clients can achieve great spaces for living. 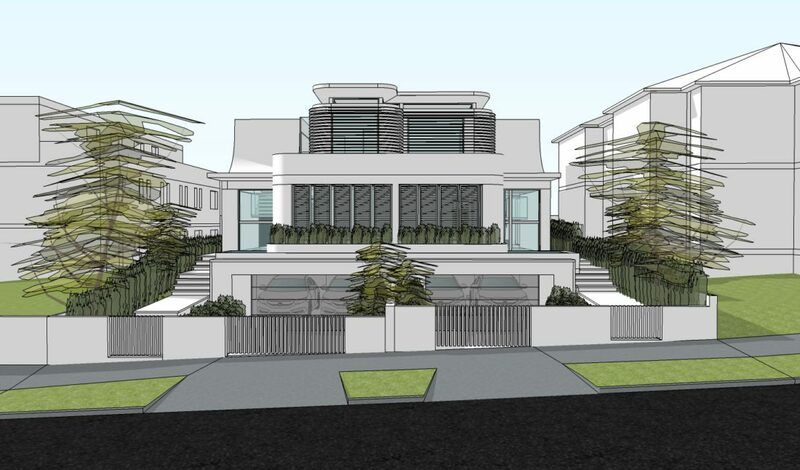 Our project in Drummoyne is an attached dual occupancy development with each dwelling of different sizes to provide spatial qualities to suit the owner yet adequate space to its new occupants. Both dwellings are designed with an open plan configuration with with voids to allow light to carry to the lower levels. The development instils our approach of creating a contemporary yet comfortable spaces and a seamless connection to the outdoors. The development is characterised by concave curved front entry area which is recessed from the street facade to reduce the overall bulk of the development. This residence aims to fulfil a clients request to create a home for modern day living yet be a home of inspiration. The design aims to create a tranquil environment for relaxation via a series of water feature elements surrounding its open plan configured living spaces. On entry, the occupants are greeted with a cantilevered concrete and steel framed stair with glass risers to allow for a visual connection to the water feature below. The 3 storey residence includes a lower level car gallery space, cinema and gym. The design aims to be a place for modern day living yet a place that inspires it owners for the challenges of the day ahead.